By now many people have heard the details of the tragic murder of Trayvon Martin by a self-styled neighborhood vigilante. 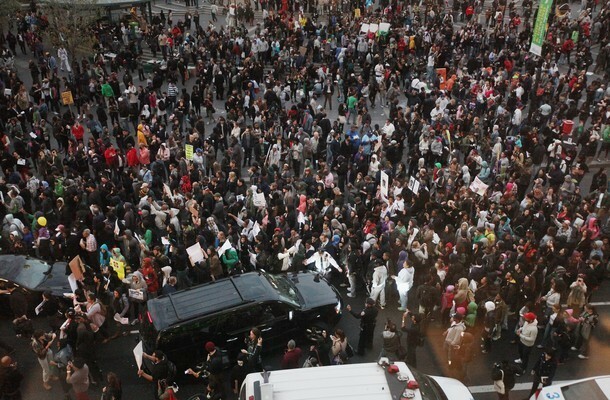 What’s less clear seems to be the organizing that has come about in an attempt to bring Trayvon’s murderer to justice. Trayvon’s parents setup a petition on Change.org to bring awareness to the situation. The petition gained steam on the Internet and has reached over 500,000 signatures. The NAACP and other traditional Black organizations have shown support for the parents but they are not the reason why thousands of mostly young people showed up at Union sq. Enter bloggers Amy Frame, Sharon Veloso Panelo and Social Media Strategist Daniel Maree. Using Facebook, YouTube and Storify they put out the call for a Million Hoodies March. They wanted the petition to reach 1 million signatures so they asked everyone to wear a hoodie on March 21 and March and to take a picture of themselves in a hoodie in order to create an image of a different America. The Hoodie being the “thing” that represents not just Trayvon’s but all Black men’s “dangerousness”. The Hoodie embodies the story of Trayvon and others who have been targeted by societies mainstream. In effect the Hoodie becomes the symbol and the thing. This ignited the imaginations of many young people of color who all came out in the streets yesterday. Occupy wall St., Occupy The Hood and city council people Jumaane Williams and Ydanis Rodrigez showed some leadership during the march but there is no doubt that the unaffiliated youth, primarily black bought the fire. When the march began it took the whole street and was able to shutdown traffic. Black college youth shouted chants of “We are Trayvon Martin” and “Don’t Shoot me, don’t hurt me, for skittles and ice tea” as the march wound the street of lower Manhattan. More than one veteran organizer that I marched with turned to me and repeated, “This is beautiful…this is beautiful”. People were angry but alive. Expressing their anger, taking space, making their voices heard and being bold. The march circled back around to Union Sq. Park but two breakaway marches went to one police plaza and Times sq. There didn’t seem to be a target (although on the Facebook page it said the march would go to the United Nations) but that seems to be a recurring theme in a number of the recent street protest. Partly due to a lack of experience of young organizers but also it seems to be a response to the growing tentacle of Capital that has seeped into every aspect of our daily lives. The idea being since capital is everywhere the goal is to just “disrupt”. Stop the system’s flows through the disruption of space. At the end of the night there seemed to be a sense of accomplishment. My one worry is that the two recent outpourings of protests that have come from Black youth have been in repose to Black death (Troy Davis being the first). Anger at Black Death will only sustain for so long. In order to keep this new energy going black youth are going to need Hope and Vision of a new world where they live and thrive instead of dying for ice tea and skittles.